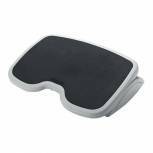 Kensington SoleSaver Foot Rest 56152 Pack of 1 Kensington SoleSaver Footrest. 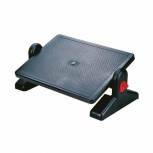 Dual height, adjustable footrest helps reduce muscle strain and fatigue. 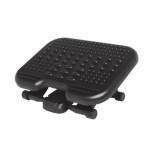 Features include two position height angle and textured foot grip platform. 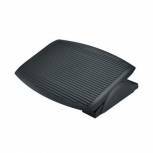 Q-Connect Black Foot Rest 29200-70 Pack of 1 Q-Connect Footrest. 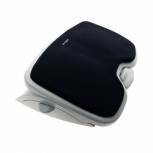 Ergonomically designed foot rest with two height adjustments and free floating platform increasing circulation and ensuring maximum comfort. Colour - Black. 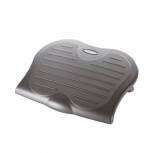 Kensington SoleMate Tilting and Adjustable Foot Rest 56145 Pack of 1 Kensington SoleMate Footrest. Adjustable footrest that helps maintain posture and circulation. Features include - non-slip feet, tilt adjustability and a comfortable generous sized foot grip, textured platform. Platform Size: W450xD350mm. 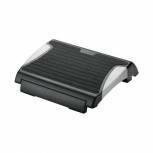 Fellowes Professional Series Black Ultimate Foot Rest 8067001 Pack of 1 Fellowes Professional Series Ultimate Foot Support. Elevates feet and legs to relieve lower back pressure. Scissor motion height adjustment provides three platform heights. Surface massage bumps relieve stress and rejuvenate tired feet. 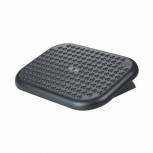 Q-Connect Black and Silver Rubber Foot Rest KF20076 Pack of 1 Q-Connect footrest with anti slip rubber mat on top platform. 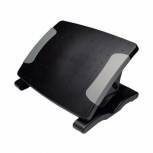 Foot support folds flat for easy height adjustment and storage under platform, (L)400 x (W) 350 x (H) 70 mm. Colour: Black/silver. 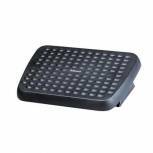 Q-Connect Economy Black Footrest KF17981 Pack of 1 Economy footrest. Helps to improve your working posture. Bumps on surface to massage feet. Tilts from 0 to 15 degrees. Platform size 448x325mm. Platform height 90mm. 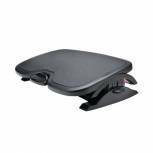 Kensington SoleMate Plus Footrest 56146 Pack of 1 Kensington SoleMate Lockable Footrest. Adjustable footrest that helps maintain posture and circulation. Features include - non-slip feet, tilt adjustability, and a comfortable generous sized foot grip, textured platform. Platform Size: W450xD350mm. 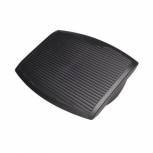 Fellowes Professional Series Black Heavy Duty Foot Rest 8064101 Pack of 1 Fellowes Professional Series Heavy Duty Foot Support. Elevates feet and legs to relieve lower back pressure. Simple height adjustment provides 3 platform heights. Steel structure and platform provides sturdy support. Non slip platform surface. 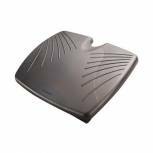 Fellowes Office Suites Adjustable Foot Rest 8035001 Pack of 1 Footrest helps prevent back and leg discomfort from poor work posture. Adjustable position using foot pressure. Rock freely back and forth to help stimulate foot and leg circulation. Microban inhibits stain and odour. 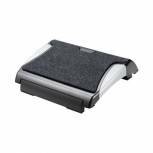 Q-Connect Black and Silver Foot Rest With Carpet KF20075 Pack of 1 Q-Connect footrest with removable and washable carpet on top platform. 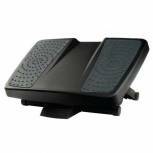 Foot support folds flat for easy height adjustment and storage under platform, (L)400 x (W) 350 x (H) 70 mm. Colour: Black/silver. 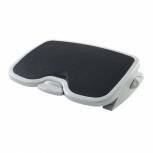 Kensington Solemassage Foot Rest 56155EU Pack of 1 Footrest with special surface designed to stimulate the nerve endings in the bottom of the foot to help relax and sooth feet Gentle rocking mechanism allows you to exercise your ankles while you sit, helping to improve circulation. With 5 height settings.